This small park celebrates the battle ship USS Biloxi and the brave men who served aboard. 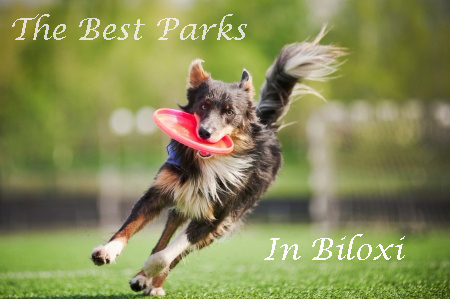 Even the largest dogs have a lot of room to run and roam and play because the park is the size of a ball field. Appropriate gates ensure that the dogs cannot get out. Smaller dogs have their own small part that is gated off for them. There is also a place to refill water bowls, a little doggy pool, and benches for the owners to relax. Only 3.14 miles from Biloxi, this park offers normal park and recreation services as well as playgrounds. Located to the southeast of Biloxi, this island is a designated Mississippi Coastal Preserve, is a rookery for the Great Blue Heron, and is great for boating and fishing. The Gulfport ferry takes you to this island, which is a part of the Gulf Island National Seashore. You will likely see bottlenose dolphins swimming beside the ferry! This island is ideal for hikes, nature exploration, picnics, and bird watching. It is well worth it to make the 21-mile drive from Biloxi to visit this 14-acre gem that has a 1,000-foot fishing pier, a beach, playgrounds, a Pavilion, picnic tables and grills.